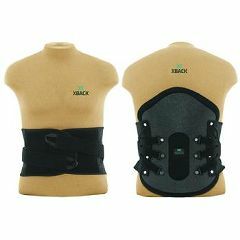 AllegroMedical.com offers The XBACK PROLIFT Back Brace. The ProLift TLSO extension brace combines an easy to adjust strapping system with no hard sternal pads. The brace is easy for patients to put on, to adjust and to remove, so the comfortable light weight brace encourages compliance with treatment protocols. The ProLift TLSO offers an increased level of support with a posterior panel that immobilizes the patient from the sacrococcygeal junction to the scapular plane. The anterior panel provides intracavitary pressure to reduce load on the intervertebral discs thus reducing pain while promoting healing.